AirServer, the technology developed by Apple that allowing you to stream music, video, photos and even games to the Mac’s big screen, is one of the most interesting features of IOS. To use this, it simply needs the Apple TV and the iDevice (iPad, iPhone, iPod Touch ) in the same wireless network. Then, just simply choose your destination and go! And apart from video and audio, IOS 5 is implemented a new feature of IOS, which even allows us to play on TV, using the iPhone / iPhone control. 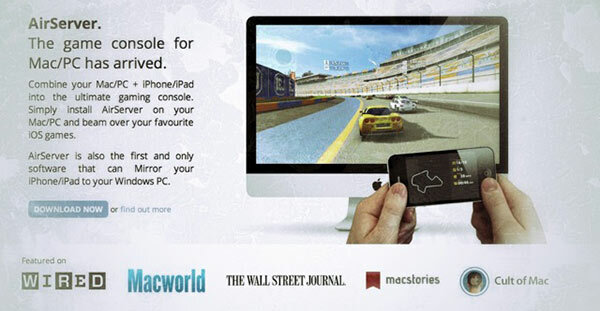 Combine your Mac/PC + iPhone/iPad into the ultimate gaming console. Simply install AirServer on your Mac/PC and beam over your favourite iOS games. AirServer is also the first and only software that can Mirror your iPhone/iPad to your Windows PC. Sure, Intel has its WiDi (Digital Wireless) allows us to do something similar, but if you’ve ever tried to configure WiDi between a TV and laptop, remember that insurance does not always work. There is also the problem of finding devices that have already implemented WiDi, not many (compared to iPhone, iPod Touch or iPhone, as all models feature support for AirPlay). AirServer, you see, makes our PC/Mac to become a sort of Apple TV. The Mac version, which is more complete, not only allows us to do iPhone screen mirroring, but acts as a true AirServer. Also AirServer is the first and only software that can Mirror your iPhone/iPad to your Windows PC. This is a pre-release version and doesn’t yet have sound or some of the eye candy features of full blown AirServer. But it does have Mirroring. And Mirroring will enable you to take your iPhone 4S and display the screen pixel perfect on your PC. In the next coming weeks they will add free updates to the PC version to bring it up to speed with the Mac version. Unfortunately, Air Server is not free. We have a free trial for 7 days. The application costs $14.99 on the Mac, and $7.99 on Windows. But if they would send the contents of the iPhone to your PC, perhaps to make presentations, or suddenly because they have a Mac Mini connected to a home theater and would like to send content from the iPhone to it, AirServer is one of the best solutions available today.